How cool is this?!! 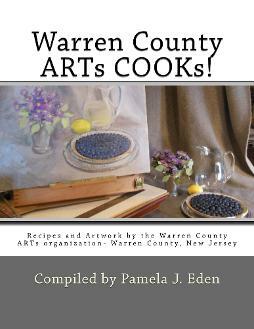 I actually authored a cookbook for the Warren County ARTs organization! Published in December 2013 is available on Amazon.com. List price is $30 (If you are an Amazon Prime member - it will be a bit less). This is a fund raising effort for the Warren County Arts (WCARTs) organization so they will receive a portion of each cookbook sold through Amazon. This is a diverse cookbook containing approximately 50% recipes and 50% artwork - all contributed by the membership of Warren County ARTs. The book contains lots of my favorite recipes and also many of my photographs. The book is 8.5" x 11" paperback with glossy cover and full color pages throughout. 152 pages. Check out the web page for Warren County ARTs for schedule of programs and exhibitions.